What a start we’ve had to this year’s fall tour–our first to Canada. We’re spending time both at the Stratford Festival and in Toronto, seeing plays in both locations. Monday we traveled to Stratford, then settled in for a Canadian Thanksgiving dinner. (Which turns out to be a lot like an American Thanksgiving Dinner.) Then, on Tuesday, we began our real Stratford Festival experience! 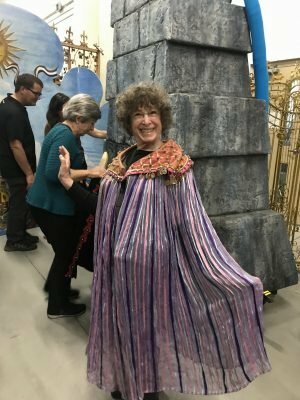 Gail Perlman enjoying her robes. The day began with a fantastic talk from David Prosser, the Literary and Editorial Director of the Festival. He shared a deep knowledge of the Festival, as well as fascinating insights about each of the plays we’d be seeing. 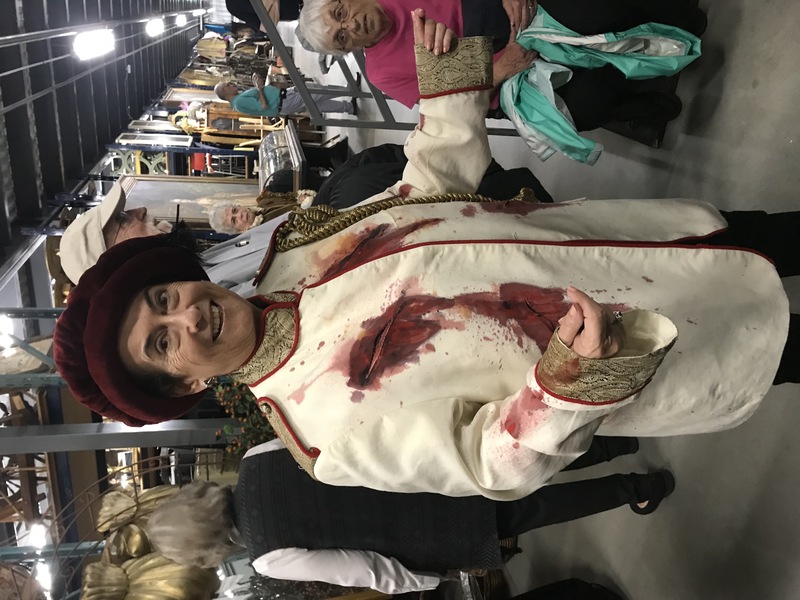 After that, we went to a tour of the Costume Warehouse, where all the costumes and props for the Festival (12 plays each summer!) are made and stored. It was fascinating to see this collection (in 110,000 square feet of space!). We also found that the tour informed our experience of each of the plays we saw. 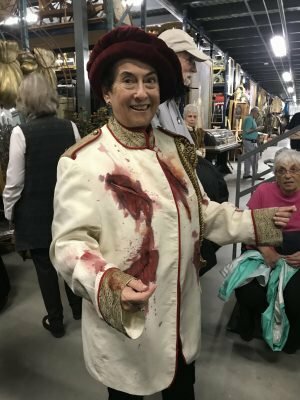 At the end of our tour, we got to try on costumes! Tuesday afternoon, we saw Oscar Wilde’s An Ideal Husband in the Avon Theatre, a beautifully restored vaudeville house in the center of Stratford. The sets were truly astonishing, and the scene changes themselves were very much part of the show. Wilde’s story of a man whose advancement in government is put at risk when a misdeed from his past might be revealed felt particularly relevant at this moment. That evening, we were at the Festival Theatre, in a beautiful park, to see The Tempest. In this production, Prospero was a Duchess rather than a Duke, and Martha Henry played the role. 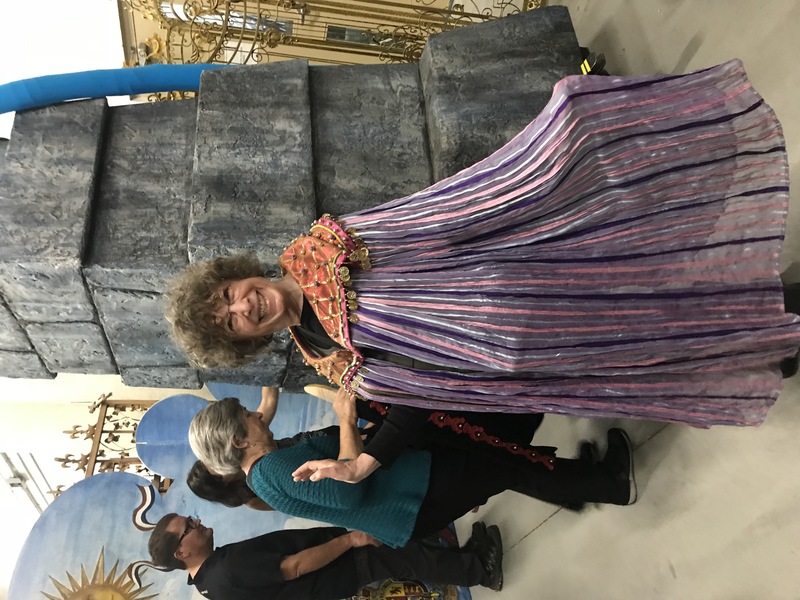 She is one of the great eminences of the Canadian theatre, and her first role at the Festival was as Miranda in a 1962 production of the same play. We were struck by how different the relationship between Prospero and Miranda felt as mother/daughter rather than father/daughter. Audrey Wilner in a dashing outfit. Whew, that was a full day. On Wednesday, we began with a conversation about both plays, and found ourselves surprised by how many connections we made between them. That afternoon, we went to the Studio Theatre, around the back of the Avon, to see Erin Shields’s Paradise Lost. The play is based on Milton’s poem, but is essentially all new language, with a few allusions to the original. Lucy Peacock (whom we had seen very briefly as Juno in The Tempest, played Satan, who was very much the lead character in a play chock full of ideas. Wednesday evening, we gathered for a lovely group dinner at the Parlour Inn. Thursday, after a conversation about Paradise Lost, we traveled on to Toronto, where we arrived at the lovely Le Germain Hotel. Now, we look forward to two more plays, and the chance to explore this wonderful city! ← Chester Theatre in The New Yorker!